Irish welcome plaque is a wooden design that features Sláinte along with a Celtic motif. This wood carved Irish blessing plaque features Sláinte, the word for good health in the Gaelic language. Sláinte is also a common Irish toast and can often be heard in pubs when glasses are clinked together in friendship. The birds that are depicted on this wall art are often seen in early Celtic art and they symbolize the link between this world and the next. The Irish welcome sign measures 6" wide x 7" tall. 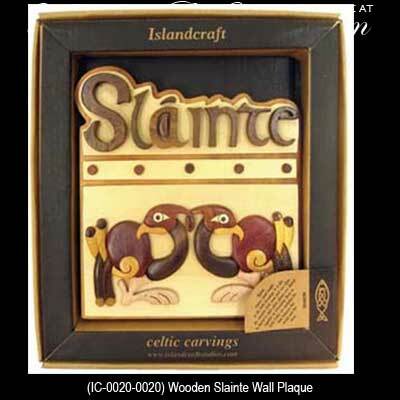 The wooden sláinte plaque is made in Ireland by Islandcraft and is gift boxed with a Celtic knot history card, complements of The Irish Gift House.